Waylander is not exactly a new player in the world of metal. Being formed in Northern Ireland in the first half of the last decade of the previous millennium, they have already celebrated their 20th anniversary a handful of years ago. After their first two demos they added a flute to their instrumental repertoire to augment the folk component in their pagan metal and it has been an important and characteristic feature of Waylander’s sound ever since. During their two decades of existence the band underwent a flood of line-up changes nowadays consisting of Ard Chieftain O’Hagan as vocalist, Saul McMichael and Tor Dennison on guitar, Steve Reynolds on bass, Lee McCartney on drums and Dave Briggs who is in charge of all specialized folk instruments. The band has unleashed two demos and four full-lengths onto the world so far and are now preparing to storm the world once more with their fifth release called Ériú’s Wheel. Considering the fact their previous releases got better critics every single time, expectations for this one are set pretty high. 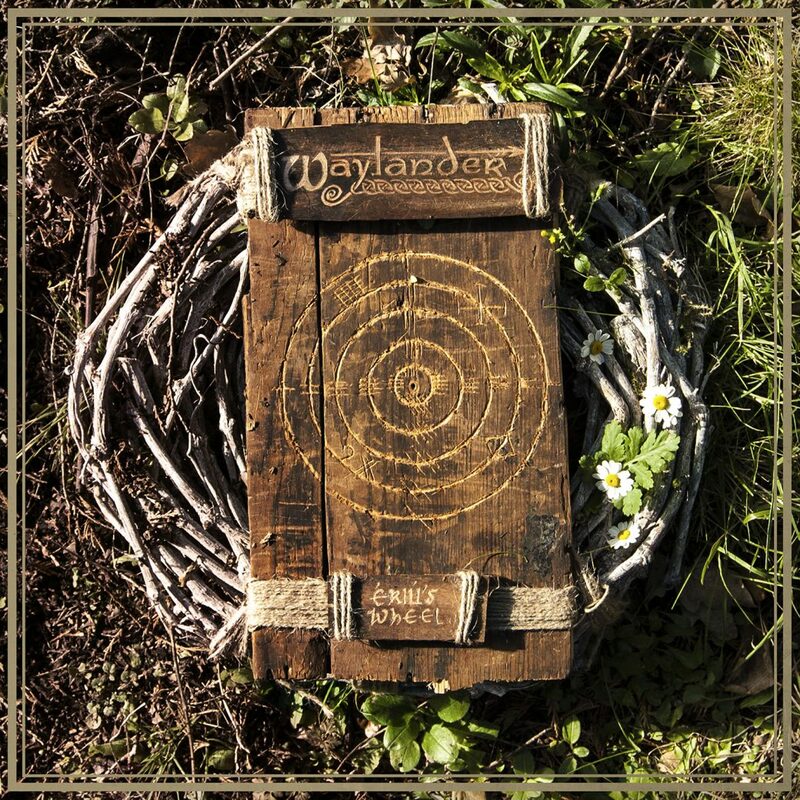 In contrast to their earlier work the boys from Waylander chose to compose a concept album, covering the wheel of the pagan year from Samhain to the Autumn Equinox within nine songs spanning a little over 46 minutes. Opening intro Betwixt Times serves as a relaxing, spoken introduction to the actual album opener As Samhain Comes, which can only be described as a classic pagan metal song with its slow, stretched parts, dark atmosphere lurking and the growling vocals with their demonic undertone. The frolicking flute brightens the atmosphere a little, but its roots remain unmistakable. Up next is Shortest Day, Longest Night, of course referring to the winter solstice, that has the same set-up. With Imbolc however things change, which, when you think about it, is only natural considering what Imbolc actually is. From here on the band adds more variety to their songs in both speed and atmosphere and they allow other influences to play a more distinct role, making the rest of the album more bright, lively and open and thus more accessible for fans that are not really into the die-hard pagan metal. Try the intro of The Vernal Dance on for size, the sweet acoustic tunes in As the Sun Stands Still or the lightly set album closer Autumnal Blaze. Needless to say the second half of the album offers more to the average user than the first, although the shroud of ominousness surrounding Waylander’s music never really leaves as To Feast at Lughnasadh proves, which in my opinion is one of the best songs on the album by the way. Waylander certainly delivers a solid album with Ériú’s Wheel, but I’m not convinced it lives up to the expectations that were set in anticipation. The songs are well composed, albeit a bit on the safe side. They don’t try to reinvent the genre which will please the fans of traditional pagan metal with distinct folk characteristics a lot. The downside of that is that they are not particularly innovative or original where it comes to their tunes. They’re good at what they do, so the album sounds pretty nice, making the lack of innovativeness not too big of a deal, but there’s still the challenge of having to keep things interesting. It’s only fair to say that on Ériú’s Wheel they actually did manage to keep things interesting, particularly in the second half of the album with the addition of some much-needed variety, so overall Ériú’s Wheel is still a good listen. Fans of pagan metal can grab this without even thinking about it and I’m convinced it’ll bring quite some pleasure to other metal fans as well, especially when you like your music spiced with a large dose of flute.